Fresh out of a two-year rebuild, Joe Joiner's "The Rebel" shows off a new paint scheme. "The Rebel" is owned by Doug Mathews. 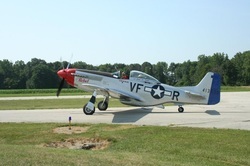 As part of the Warhawk Museum's flying collection, Bee took to the skies recently with other P-51's and P-40's at the museum's P-51 Rally in July. 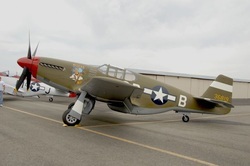 An enthusiastic crowd turned out in Nampa, Idaho for a great weekend of flying and reminicsing.